A Bit Backward . . .: You'll never have to buy syrup again! You'll never have to buy syrup again! Thanks to my friend Kristen (Robinson) Doe and her amazing recipe, Squire and I pretty much never touch our bottle of Mrs.Butterworth's these days, and you won't want to either if you try out this little gem. Mix and heat all of the above ingredients together in a saucepan. Bring to boiling, and boil for 2-3 min. or until it begins to look frothy. Stir in well. Don't worry about the froth. It tastes good, and settles eventually. Hope you enjoy this as much as Squire and I do! Oh, and don't forget to refrigerate this syrup since it has milk products in it. Just microwave for a couple minutes each time you take it out for breakfast. Need a recipe to accompany the syrup? I recommend this perfect recipe for pancakes, with banana slices baked in them, and with fresh sliced strawberries piled on top. Yum! I totally gave you credit. But, if you need some more, I'll add your last name too. ;) Yes. Let's. Myself, I'm all about real-maple-syrup, but Ryan is always making me buy the fake stuff that he grew up on. Maybe this recipe will convert him and I'll never have to buy another bottle. Anyway, my favorite thing about this post is the heart-shaped bananas. Adorable. Thank you...you posted this recipe for me. Our family was out hunting tonite and I was thinking in my head, "I want to make the kids pancakes for breakfast tomorrow morning before I send them off to school...but I am tired of my recipe ...it doesn't always turn out...maybe I'll search allrecipes for a new one...bla bla bla" So thank you Jami, you made my search so much easier! You were inspired! @ Ruthy: I wish I could claim the heart-shaped banana idea for my own, but I just found the pic online. They are so cute though! I think I will have to do some for myself in the near future. Holy cow, those look good!!! Also, I love the Lessons Learned While Swimming Laps. It made me get off my tooshie and clean my house and then work on a project I've got going. You're great, Jami!!! 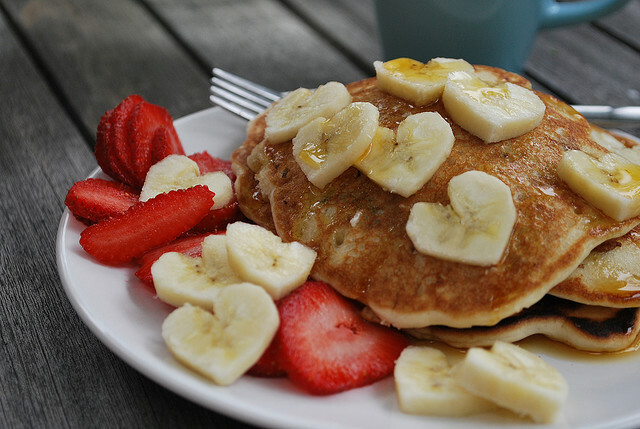 Please tell me those are your pancakes and you took the time to cut the fruit into little hearts. It will make me feel really good about myself. @ Heather: Haha. Those are not my pancakes. I wish!! I just found that pic online. I will definitely be trying them soon though. They are so cute!! !